TECH: Flood Walls Keep This Austrian Town Safe - Something New Everyday! Floods can be some of the most devastating natural disasters, killing hundreds of thousands each year. Engineers in Austria however have solved this problem by erecting walls capable of holding back millions of gallons of water that are completely removable! It is quite a feat of engineering to see a relatively thin steel wall hold back 15 feet of water which could spell impending doom for the houses around. 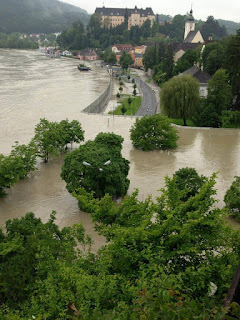 Back in 2013, much of Europe suffered from tremendous flooding, and the following video demonstrates how the Austrian municipality of Machland was protected by some ingenious flood wall engineering. It seems impossible, but some ingenious engineering allowed the thin wall to hold back the pressure from the water. In what is essentially a vertical cantilever design, each post was placed in a large concrete and aluminum footing extending 5 meters into the soil foundation. As the immense water weight creates a pressure along the wall, the force is carried through the aluminum posts into the much stronger foundation. These portable walls are a part of the greater Machland Dam superstructure which extends 70 kilometers along the coast and floodplain. When faced with such a beautiful town and landscape that is prone to extreme flooding, the ability to simply construct permanent flood walls was ruled out for a more aesthetic solution found in removable aluminum walls. If you notice in the video above, off to the right there were still some unlucky homeowners who do not benefit from the flood wall and instead find their homes flooded. This flood prevention technique while intriguing, actually creates what some might call unnecessary risk in an effort to keep the towns view. A more permanent solution would have obviously been stronger and able to hold up to more hydrostatic pressure from the water. Instead, with the portable aesthetic solution, the risk of catastrophic failure is increased. If the flood walls were to fail when fully loaded as seen above, a large wave would sweep across the landscape likely destroying the structures it was meant to preserve. So far though, the flood walls have stood up to the test, and the people of Machland can rest easy. The exact CAD design sheets for the wall are available through the Machland Dam website here. One disclaimer however, all of the design sheets are in German, though you can still get a general idea of how the structure was built. Creative engineering is often the product of a designer's or architect's far fetched idea. As the world demands not to have their view blocked by ugly walls, the stress falls upon the engineer to make those people safe while not making them upset. Some of the most incredible feats of engineering are created when engineers think outside of the box and push the limits of what was previously thought possible.